Food is everything. It’s social. It’s comforting. It’s creative. It is the thing that we, as living beings, do and it is no longer something we do just to survive. For many, food has become a hobby. More specifically, society has named these hobbyists, “Foodies”. So, technically, I am a foodie. But, for the record, I don’t consider myself a foodie but more like a food enthusiast. It sounds more serious. And that’s because to me, it is. My obsession with food started long before I decided to start blogging, but I didn’t know what I was until I started channeling this love into posts. Blogging has created an outlet for me to talk about what interests me the most. It gave me a reason to come home to my empty apartment and cook something as opposed to ordering take out, like my other roommates did. And when I wasn’t cooking, I was dining out at a restaurant with my camera in my hand. As a food blogger, I have sort of built a reputation for myself. As a person that takes food so seriously, a lot of friends come to me for food recommendations. It gives me a great sense of pride helping someone fall in love with a dish or try a new restaurant. When I first recommended a restaurant to my parents back when I was a teenager, they returned from the restaurant with full and happy bellies. That feeling, knowing they not only took my recommendation but loved it, was incredible. I now live for those moments when people put their trust in me to make sure they have a great meal. I will admit that sometimes it doesn’t go as well as I had hoped. My success rate is about 90%; not too shabby if I may say so myself. Most often though, I get asked what my favorite food is or what my favorite restaurant is. And as much as I am a food enthusiast, I always respond with “I don’t have a favorite. There are too many to choose from”. And being that my friend, Angel, has such confidence in my opinion when it comes to food, I thought I would share it with you. Otto Enoteca Pizzeria in the Greenwich Village is, hands down, my favorite place to dine and to recommend to people for all occasions. Visiting NYC? Go to Otto. Celebrating a Special Occasion? Go to Otto. Want a good Wine List? Go to Otto. On a Budget? Go to Otto. 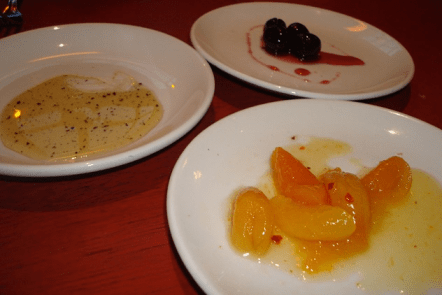 Otto Enoteca Pizzeria, the product of Food Celebrity Mario Batali, is unlike the rest of the Batali joints. Otto maintains that fine dining feel but with prices that might make one question the quality. Rest assured the quality is top notch. Here are some of the things that make my mouth water at Otto. The menu. You will notice that there is only one page out of a four page menu that is dedicated to food. The rest is all wine! You won’t find any of that commercial wine here but imported stuff that is listed by the origin. If you aren’t familiar with the wine and the proper pairings, there are staff nearby that are experts when it comes to wine. Cheese plates. While I don’t indulge in the cheese platter often, sometimes I get the craving for cheese that is unlike any other I have had. When you order cheese, you can select from their short list (of all very good stuff!) and it comes with truffle honey (my personal favorite), apricots and cherries. I really only care about the truffle honey and cheese. Antipasto. This has become the one thing that I cannot resist when I come to OTTO. An Italian appetizer, the antipastos are the perfect portion for tasting with your guests without ruining all the precious room in your belly for your entrée. 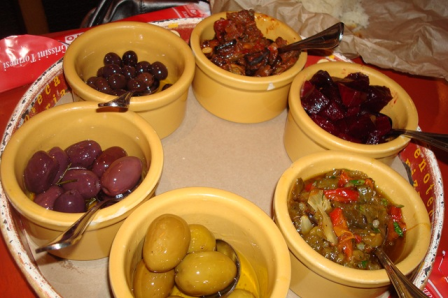 The items that you cannot miss are the Eggplant Caponatina, the Roasted Beets with Horseradish, and the peppers and capers. Fresh Homemade Pasta. For $10 you can get a dish of fresh homemade pasta. 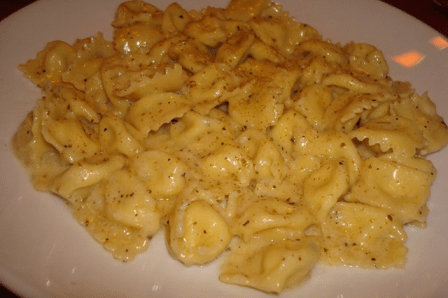 The angliotti are like tiny raviolis or tortellini that have been filled with cheese. Its served with a simple browned butter sauce that makes it a dish like no other. For me, this is a nice treat but its not something that I order all of the time. Rigatoni Con Sausage and Escarole. It is, by far, my favorite dish. 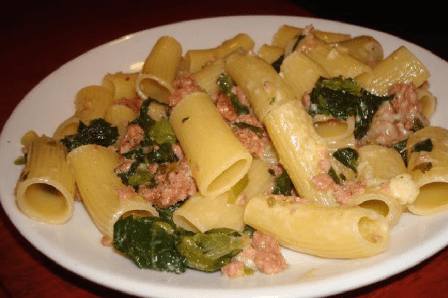 Its rustic with bits of sausage and escarole in a light sauce with cheese and a hint of spice with rigatoni that has been cooked to perfection. When all else fails, I get this dish… if I have guests that want to share with me I also recommend the Tacozzette con Stracotto. It is usually on the menu but the last time I was there it wasn’t. And I cried a little inside. The Tacozzette con Stracotto is a wide and flat pasta with a shredded pork in marinara sauce. Its hearty and comforting and tastes just like grandma used to make it. Pizza. They do have pizza here. But this is NYC, you can get pizza damn near everywhere. But if you MUST get pizza, I recommend a special. Get something that you can’t get anywhere else. 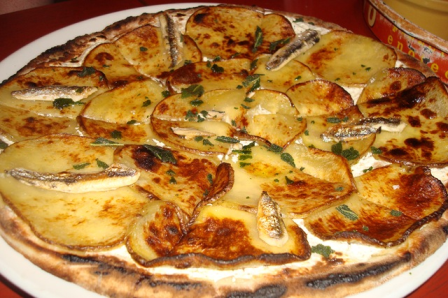 Above is an anchovy and potato pizza. This was a nice change of pace at Otto, but if I am being honest, my heart belongs to the pasta. Forever and always. Dessert. Desserts are seasonal at Otto so coming back every now and then you will find that your favorite dessert might not be listed. There have always been some great desserts but when I don’t see anything new, I go for my tried and true. 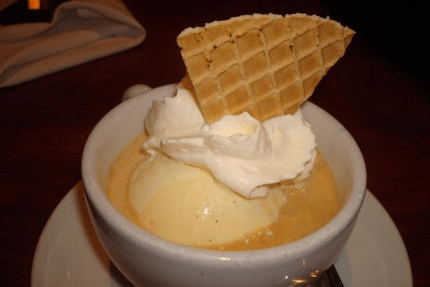 The Affogato. A heaping scoop of vanilla gelato is served in a coffee cup and it is brought to you with a freshly pulled shot of espresso. Pour the hot espresso over the gelato and dig in. So, there you have it; my favorite restaurant in NYC. 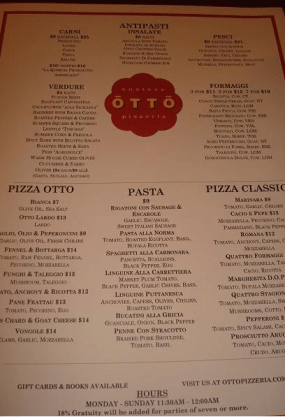 If you happen to be in the mood for some Tuscan/Italian cuisine or want to take someone special out, Otto is a great choice. If you have never heard of Otto before today, now it’s on your radar. Check out Otto Enoteca Pizzeria on your favorite review site. Remember the meaning of Memorial Day. Is Bain Capital really evil?